Heralded as the "Best Four Days in Gaming,” Gen Con has become an annual gathering place of the uniquely like-minded hordes of gaming fans. 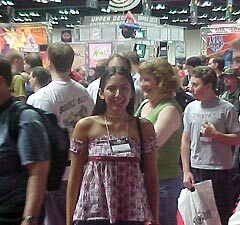 Gen Con Indy 2005 was no different; approximately 26,000 people attended this four-day festival. The first goal of many attendees was shopping. With no less than 240 booths offering a variety of gaming goodies, everyone who attended surely found something to take home. Although Gen Con is dedicated to gaming, anime plays a large part as well. There were at least three booths whose sole purpose was to spread the love of anime. Those looking to buy that most-wanted DVD could travel to the Media Blasters booth, and then travel all of the way to the other side to visit the Anime Pavilion booth. While at the Anime Pavilion, they could stop next door at the Anime Palace to purchase several kinds of anime merchandise. If that wasn't enough, attendees were treated to sneak peeks from Bandai, featuring new anime and games. Other hard-to-find items were sold throughout the convention floor. Attendees didn't always have to purchase items, as there was plenty of free swag to go around. Attendees looking for more rare gaming items attended the Game Auction. Guests could bid on or even sell items they desired or no longer wanted. At Gen Con So Cal 2003, a case of ten original sealed booster display boxes of Magic: the Gathering Arabian Nights was sold for $95,000. The Gen Con staff was hoping to duplicate such greatness this year in Indianapolis. Those not in the mood to shop could stop by one of a handful of gaming stations. Wizards of the Coast had plenty of room on the show floor. 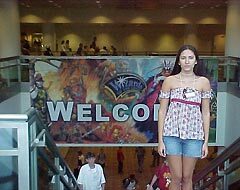 With two large areas devoted to previewing, promoting and selling their much-loved titles, Wizards of the Coast was kept busy throughout the convention. Newcomers could stop by for demos of new collectible card games, or stop by Wizkids for some miniatures action. For the first time, the new Mage Knight Nexus boosters were available, nearly a week prior to store dates! If Wizards of the Coast wasn't enough of a fan favorite, there was also Bandai, featuring their new Zatch Bell CCG. Plenty of other competitions went on as well. In rooms throughout the convention center, tournaments were taking place during most hours. Attendees didn't have to be professional players; several tournaments were meant for any fan to sit in on some action to see if their skills could hold up. The various types of games played included CCGs, RPGs, miniatures (historical and non-historical), and live action RPGs (LARPs). There was also a costume contest where contestants were graded on the costume and talent, with the costuming aspect playing the minor role. Another contest involved speed painting. Each contestant was given a miniature to paint within a set time limit. 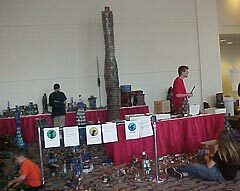 The winners from each round competed on the last day for the grand prize. For the more anime obsessed, there were two anime viewing rooms in the adjacent hotel. The first was hosted by the Indiana Animation Club, and it ran nearly twenty-four hours every day of the convention. They previewed shows such as Rozen Maiden and Futakoi Alternative, while catering to those who wanted to see U.S. released titles, such as Azumanga Daioh, Steamboy and Record of Lodoss War. The other room was presented by Hades Pro Heavy Industries, a negative-profit organization committed to uniting anime and fans. On their list were such hit shows and movies as Shuffle!, My Hime, and Ghost in the Shell: Innocence. HPHI had between 300-400 audience members during its peak hours, although the video room was open nearly twenty-four hours a day as well. Another type of artistic viewing was the art show, which was moved into the showroom this year. Dozens of artists crammed into their spaces to show off their creativity, with many beautiful works of art on display. Jeff Easley stopped by as the Artist Guest of Honor. Mr. Easley works as a freelance artist now, but he worked for over twenty years with TSR and Wizards of the Coast. Several seminars and workshops were held as well. Industry guests of honor took part in these events, which discussed everything from the state of the hobby gaming industry to writing fiction. Each seminar/workshop was tailored to specific areas. Industry insiders included Tracy and Laura Hickman, Mike Gray, and Christian Petersen. They weren’t the only guests either. At the autograph booths this year were Summer Glau and Ron Glass from Firefly and the upcoming movie Serenity, Ernie Hudson of Ghostbuster fame, Rob Van Dam from the WWE, Dean Haglund from The X-Files and Fred Williamson who appeared in From Dusk Till Dawn. 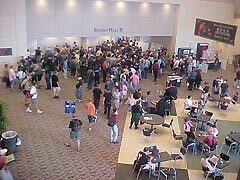 Now that Gen Con Indy 2005 is over, attendees are already wondering about next year. Hopes are high that it will top this year's event, and there will be even more gaming goodies to look forward to.